It was early May and I was enjoying the 25°C in the Corsican sun, standing on the terrace of the 4* Hôtel-Demeure Les Mouettes, listening to the waves of the Mediterranean sea below me and admiring the Bay of Ajaccio. This 19th Century villa, part of the Châteaux & Hôtels Collection, has been renovated and decorated in pastel hues, using quality materials to create what the owner, Jean-Baptiste Pieri calls “discrete luxury”. White arches contrast against the ochre façade and in concert with the pine and palm trees, it looks like a neoclassical Italian villa. Even so, this is one of Corsica’s first palatial properties chosen by celebrities such as Maria Callas or Michael Schumacher as the place to stay in the region. Those looking for a luxury in a discrete venue. Each of the 24 rooms and 3 suites are individually decorated, some retaining original 19th Century features while others are renovated neoclassical style. I stayed in the Privilege Room, a spacious 25m² room with beige carpets contrasting against all-white walls and furniture. My favourite moment was relaxing with a book on the panoramic sea view terrace, soaking up the Mediterranean sun. 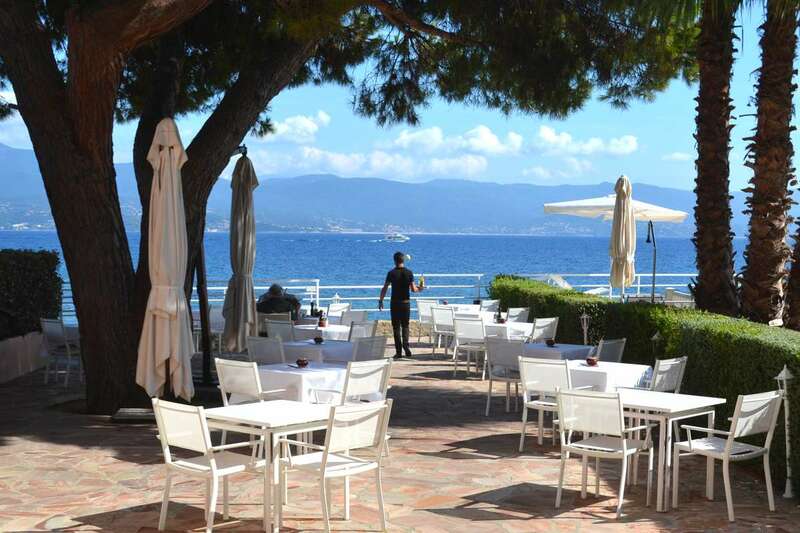 Although there is no restaurant at Les Mouettes, this is not a problem: Ajaccio city centre is less than 30 minutes walk along the coastline and has a wide range of traditional and modern restaurants. For those feeling peckish in the afternoon, the gourmet snack bar serves organic farm products like Corsican cheese and charcuterie and a selection of local wines. 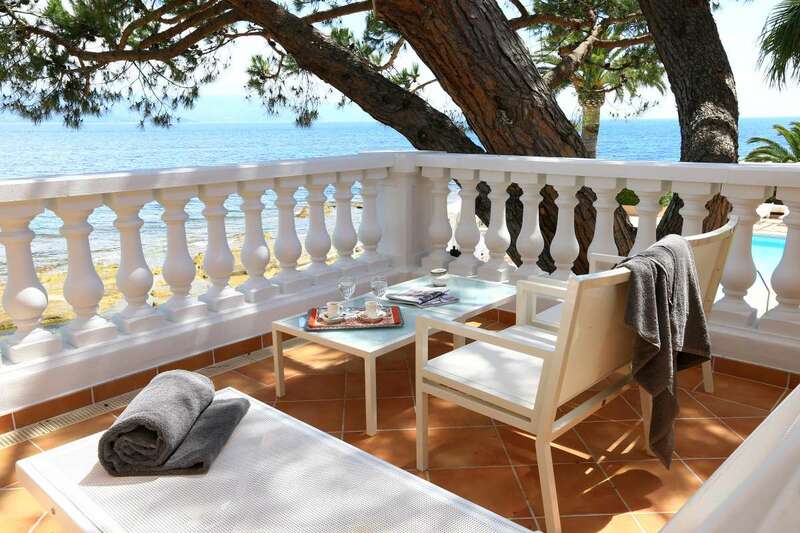 For breakfast, warm bread and croissants or a cooked breakfast (I chose scrambled eggs and ham), as well as fresh fruit are served on the terrace overlooking the sea, under the shade of the ancient pine tree. There is a small private sandy beach in front of the hotel with plenty of sun loungers and complimentary snorkelling gear for hotel guests to use. You can rent one of hotel’s stand-up paddles and explore the Bay of Ajaccio. There is also a large seawater swimming pool, heated between April and October. The jacuzzi, also heated, makes for a very romantic setting, as it is tucked in the corner of the terrace, directly overlooking the sea. The spa features an open air, heated treatment room and a hamam. A short walk will take you to the centre of Ajaccio, the birthplace of the French Emperor Napoléon Bonaparte. Casa Bonaparte, the house in which he was born in 1769 is today a museum. Another museum well worth a visit is the Musée Fesch, containing one of France’s finest collections of old masters, including Botticelli, Canaletto, De Tura, Titian, Veronese, and Poussin. The 16th Century Cathedral has a lovely ochre Baroque façade and murals painted by Tintoretto and Delacroix inside. 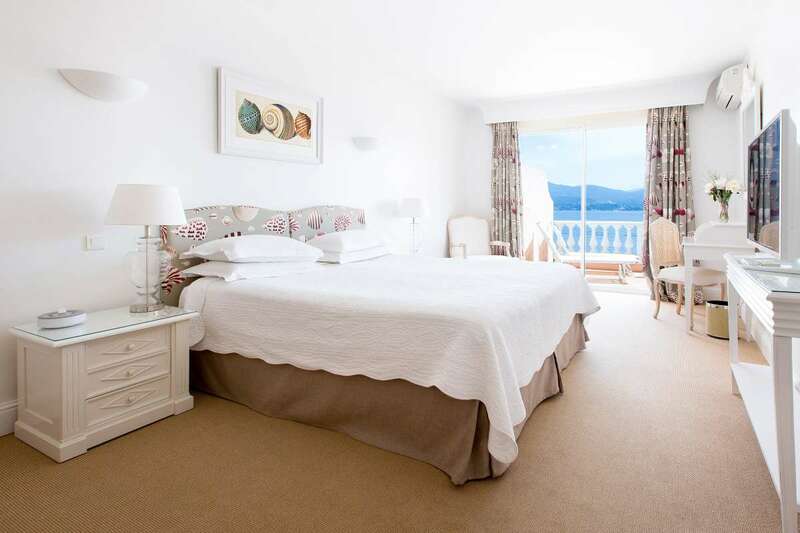 Nearby is the scenic Route des Sanguinaires, boasting a succession of small, secluded beaches. Hire a bicycle from the hotel and head towards the Pointe de la Parata to see the spectacular view of the Sanguinaires Islands.